Free Electric Vehicle 101 Workshops Saturday, October 27, 10am-11:30am, Tacoma Public Library (Main Branch) | Considering an electric vehicle? Join this free workshop to learn more about your options and the benefits of going EV. Additional dates available. Tacoma Roots Summit Tuesday, October 23, 6pm-8:30pm, Evergreen Tacoma, 1210 6th Ave. | Once a season, Tacoma Roots: Environmental Justice Forum hosts a summit to discuss environmental justice issues in our area. This summit will focus on affordable housing and sustainability. Tacoma Green Drinks Thursday, November 1, 6pm, The Camp Bar, 1310 Tacoma Ave S. | Join this fun and casual networking event where you can catch a different eco-friendly topic at a different bar in Tacoma every month. The November host is the Ikkatsu Project. Sustainable Tacoma Commission Meets every 2nd Tuesday, 4:30PM to 6:30PM, at the Tacoma Municipal Building, 747 Market St. Room 243 | Free and open to the public. Sustainability Speaker Series Schedule a member of the OEPS team to present on a variety of sustainability topics for your organization or group. Call (253) 591-5172 to book. Healthy Homes, Healthy Neighborhoods Providing resources and opportunities to address big environmental challenges on a small scale, one neighborhood at a time. Tacoma Green Living Guide This interactive map features many of Tacoma’s resources and efforts toward more sustainable living. Find information about how to get around, where to find locally grown food, places to enjoy nature in the city, and more. The City of Tacoma EnviroHouse is a permanent model home showcasing green building and natural landscape ideas, materials and techniques to create a healthy home and planet. EnviroShorts Learn about the City of Tacoma’s waste management resources. Urban Green City of Tacoma’s sustainable highlights, from businesses to parks. Tacoma Report Eco Archive of videos featuring the City of Tacoma’s green livability. EnviroHouse How-To's Get the step by step on DIY sustainable projects you can do around the house. 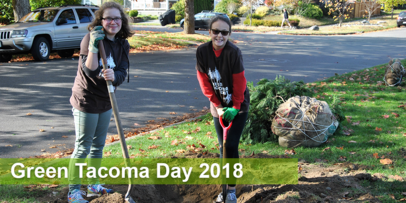 On Saturday, October 13, roughly 240 community volunteers came together for Green Tacoma Day, helping to beautify our wetlands, parks, and open spaces. Projects at eleven different sites around the city included tree planting, invasive species removal, litter pickup, and overall restoration of our green spaces. Celebrating its 10th year, this annual day of service brought neighbors and community members together to help preserve and protect our natural landscapes. Thank you to everyone that participated! During the month of October, OEPS is partnering with local coffee shops in an effort to reduce single-use cup waste in our community. Surprising to many, single-use paper coffee cups are not recyclable in most municipalities (including Tacoma) due to the thin plastic layer on the inside. Our “BYOMug” campaign is aimed at raising awareness of single-use paper coffee cup waste, and reducing the amount of non-recyclable material entering our waste stream. Each week during the campaign, participating coffee shops are offering discounts and specials to customers who opt to bring their own reusable travel mug as an alternative to single-use cups. 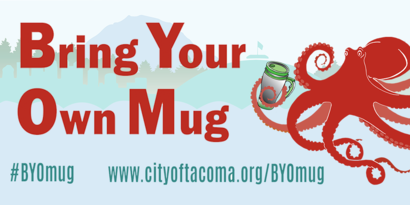 Look for the “Bring Your Own Mug” window stickers at participating shops, or click here for the full list and discount details. Scientists from Washington Sea Grant and the Climate Impacts Group have developed new and localized relative sea level rise (SLR) projections for Washington State. Through the Washington Coastal Resilience Project (WCRP), scientists measured vertical land movement at 171 points along the entire Washington coastline. They combined this land data with updated global and regional absolute sea level rise data to create localized SLR projections. 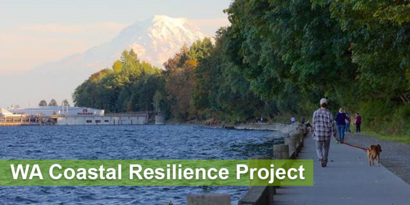 In 2016, the City of Tacoma was included in a team led by the Washington Department of Ecology and Washington Sea Grant to receive a competitive grant from NOAA to assess the impact of climate change on coastal communities. This summer, the science team issued their report available here: Projected Sea Level Rise for Washington State. 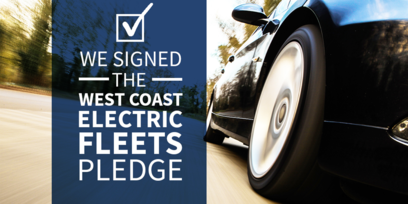 The City and Tacoma Public Utilities (TPU) have signed the West Coast Electric Fleets pledge at the Highway level. Through the pledge, fleet managers are making the commitment that at least 3 percent of all new passenger car replacement purchases are to be zero-emission vehicles. The pledge also holds an agreement to revisit the commitment annually to see if that percentage can be increased. As a signee, the City gains access to a series of practical resources and tools to assist with changing the City’s fleet to zero-emission vehicles. Joining this initiative fulfills one of 14 specific actions in the City’s Environmental Action Plan aimed at reducing greenhouse gas emissions. To learn more about the Environmental Action Plan, visit cityoftacoma.org/EAP. The popular Tree Coupon Program expanded into the entirety of Pierce County in the 2017-18 season. Thanks to grant funding from the Puyallup Watershed Initiative’s Forestry Community of Interest, 220 coupons were distributed and 511 trees were purchased (fifty more than the previous year). Purchase rates were higher in Tacoma, at 56%, compared to Pierce County, at 44%. There were 5 participating nurseries in the 2017-18 season, and we have added more in 2018-19. City staff and partners are excited about the program and the opportunity to continue to expand a healthy tree canopy throughout Pierce County. Coupons are valid until April 1, 2019 for the 2018-19 season. Trees purchased may be planted on private property or in the right-of-way (such as the planting strip) areas abutting private property. 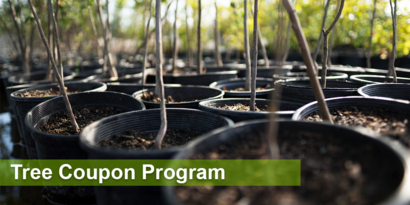 Request your free tree coupon online here or email trees@cityoftacoma.org. 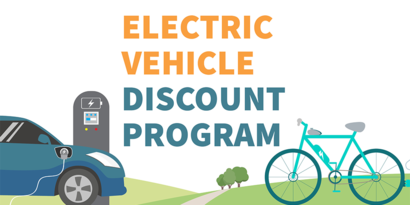 The City of Tacoma and Tacoma Public Utilities have partnered to launch an Electric Vehicle Discount Program to lower the cost of purchasing or leasing an electric car or bike in Tacoma. This is a pre-negotiated pricing program with local Tacoma dealerships and bike shops to deliver a no-hassle deal to interested buyers. You can save thousands of dollars on full battery electric vehicles, plug-in hybrid vehicles, and electric bicycles. When purchasing an electric vehicle, you will also receive a discount on selected home charging equipment through select manufacturers. Available discounts are provided directly through each participating dealership, and not through the City of Tacoma. Learn more about the program and sign up to participate here! 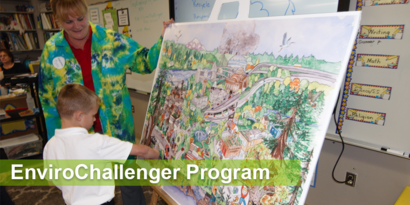 Tacoma public and private schools are back in session, and our EnviroChallenger team is continuing its mission to bring engaging, high-quality environmental science lessons to students in our area. Using the “5R’s: Reduce, Reuse, Recycle, Respect, and Responsibility”, the EnviroChallengers help teach elementary and middle school students a mix of science and social responsibility in a fun and unique way. The latest program, “2, 5, Tree: Why Plant a Tree?” introduces students to the benefits of trees in our community. Finally, we are pleased to welcome Makenzie Mendelson as the newest EnviroChallenger Educator, whose focus is on integrating art lessons into the programs. Learn more and book a lesson with the EnviroChallengers online. 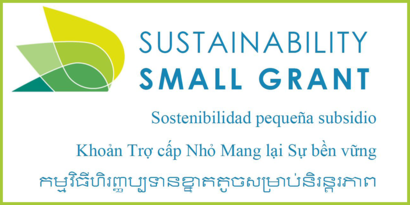 We’re pleased to announce that a new round of Sustainability Small Grant applications is now open! If you or your organization has an idea to help educate residents and/or businesses on the environment and sustainable practices, we encourage you to apply. A reimbursable maximum award up to $5,000 is open to anyone considering a project within Tacoma city limits that represents a benefit to one of more of the three Environmental Services utilities (surface water, waste water, or solid waste services). Applications will be reviewed by the Sustainable Tacoma Commission, and the reimbursement grants will be awarded quarterly. Previous grant recipients include food rescue programs, community gardens, school education programs, and environmental tours and events. For more information and application guidelines, visit our Sustainability Small Grant website or call (253) 591-5172.